We specialise in providing intensive training programs to achieve timely and cost effective solutions for our clients. The Australian Barista School is based in Melbourne, Sydney, Brisbane and Newcastle and was established with a mission to provide affordable coffee training and coffee classes by people passionate about coffee. 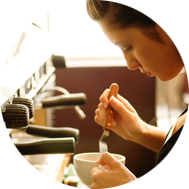 We are a group of Melbourne, Sydney, Brisbane and Newcastle coffee industry people. The principals have owned a roaster and espresso bars. We are specialists in the modern way of making coffee. Book securely online 24/7. No credit card? Our booking office for barista classes is on level 10 of the Dymocks Building (428 George St, Sydney CBD) and is open Mon-Fri 9am-5pm. Pay cash/EFTPOS or credit card only available in Sydney (not other sites) but bookings prior to the day of your coffee course are essential as class sizes are strictly limited.